These spots form when the process of muscle contraction and relaxation gets off kilter. This trauma causes the muscle band(s) to get stuck in a contracted state. This squeezing of a band of muscles affects both the direct muscle involved and the capillaries feeding it as well as surrounding muscles blood and oxygen. The longer these muscles stay in the contracted state with no or limited supply of blood or oxygen, the more dense they become and they tighter they pull. Can I stretch and release these trigger points? Because of the contracted state of the muscle and the pain involved, fully stretching a muscle with a trigger point is too painful. You can further damage the surrounding tissue while still not releasing the bound tissue if you try to “stretch through the pain”. Imagine, if you will, a rubber band with a knot in it. Pulling the rubber band will not get rid of the knot. However, if you pull hard enough you will snap the rubber band. Is acupuncture therapy the most effective way of releasing trigger points? Other manual release techniques often require direct pressure to the trigger/ashi point, which in my opinion can be brutal, though sometimes necessary. A well-placed acupuncture needle using the correct techniques can go right into the depth of the trigger point only causing momentary (if any) pain to the surrounding area. There is simply no other technique that can offer such precision. In order to effectively treat a trigger point, it is crucial that the acupuncture treatment is administered by someone who knows not only how to properly insert the needle but also has advanced training in additional methods. Once the point is released, there are techniques that flush the muscle with blood, oxygen and energy. These make a tremendous difference in achieving long-term pain relief. Stop procrastinating and discover the benefits of acupuncture today! 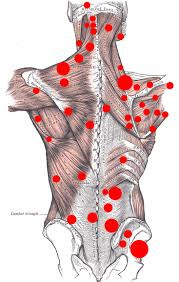 Trigger points form because of a sustained muscle contraction, strain or overuse. When you work out, do not do too much too soon! Stretch to the point where you feel lengthening but not so much that you feel pain. If you stretch to the point of pain, you are often pulling the muscle so tight that you are squishing off the blood circulation and risking further injury. Zhan Zhuang (standing meditation exercise). Zhan Zhuang acts as a systemic total body reset. These deceptively simple exercises stimulate circulation of blood, relax the nervous system, and expose plus slowly dissolve know and partially healed(hidden) injuries. Work though simple range of motion movements and exercises. Work to break up the adhesions. This can be done in many ways and will often not produce any immediate effects, but over time with stretching, will break down and soften the bound up tissue. — Foam rolling the whole length of the muscle from tendon to tendon is a good place to start. This will flush blood in the area. — Apply a topical liniment or plaster. Talk to your acupuncturist about what type of external herbal formula is most appropriate for your injury.